Amazon on Thursday confirmed that Fire TV will add unified voice search compatibility with Hulu Plus, Crackle and Showtime Anytime this summer, extending the capability of the Apple TV competitor. 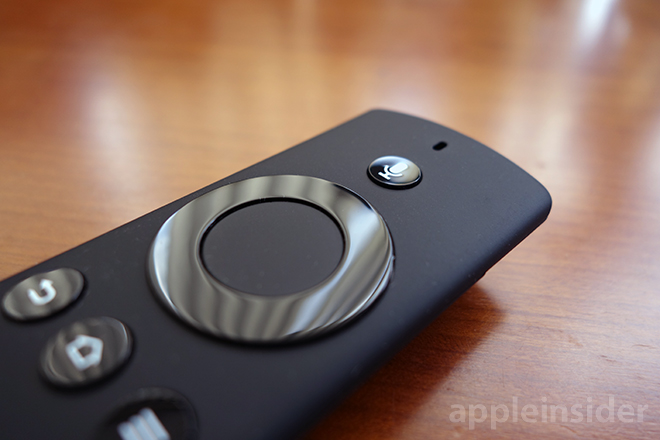 In AppleInsider's review of Fire TV, we noted that voice search, one of the platform's tentpole features, was held back by a distinct lack of compatibility with third-party apps and services. To fix the issue, Amazon is working on deals with big-name content providers to integrate their full catalogs with Fire TV's unified search function, the company said. So far, the list includes music video service VEVO, Hulu Plus, Crackle and Showtime Anytime. "We're excited and energized by the momentum we're seeing with Fire TV," said Amazon Devices Vice President Dave Limp. "Customers are telling us they love it, developers are building for it, and we're working hard to expand existing features and build new ones." Voice search is one of Fire TV's major draws. The unit's remote control uses a built-in microphone to gather voice commands that are sent off for speech recognition translation in the cloud. Results are fed back to the set-top box in a roundtrip process that takes mere seconds, effectively negating the need for clunky on-screen keyboards. Users can conduct searches from anywhere in Fire TV by pressing the remote's dedicated voice search button, but for now all returned content comes from Amazon's servers. For example, when searching for a movie available on both Netflix and Amazon, the box only display options from Amazon's store. The company hopes to change that with the inclusion of third-party catalogs. While the additions are a step in the right direction, Amazon has a long way to go if it intends to deliver a useful backend for what is actually a powerful feature. As it stands, voice search is just a fast and easy way to funnel customers into the company's own digital storefront. This may be great for Amazon Prime subscribers, but for those not dedicated to Amazon's ecosystem, the $99 Fire TV offers only marginal benefits over competing platforms like Apple TV and Roku.